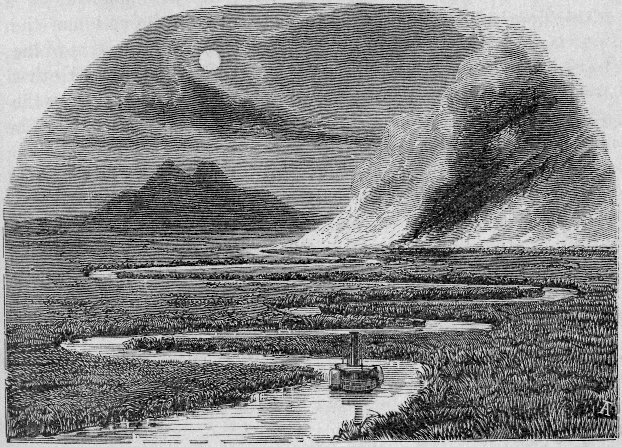 “Night Scene on the San Joaquin River—Monte Diablo in the Distance,” engraving from Scenes of Wonder and Curiosity in California (1862) by James M. Hutchings. Almost every Californian has seen Monte Diablo. It is the great central landmark of the state. Whether we are walking in the streets of San Francisco, or sailing on any of our bays and navigable rivers, or riding on any of the roads in the Sacramento and San Joaquin Valleys, or standing on the elevated ridges of the mining districts before us—in lonely boldness, and at almost every turn, we see Monte del Diablo. Probably from its apparent omnipresence we are indebted to its singular name, Mount of the Devil. That same year another local resident, twenty-six years of age, used Monte del Diablo as the setting for one of his earliest stories. Like Hutchings, Bret Harte (a native of Albany, New York) had moved to California during the Gold Rush years and he too had just begun a career as a writer. The story appeared in the September 1863 issue of the magazine, alongside Thoreau’s “Life Without Principle.” Five years later, Harte would write “The Luck of the Roaring Camp” and “The Outcasts of Poker Flat,” the two stories which made him internationally famous—and they would both appear in Overland Monthly, the California-based magazine he himself edited. Over the course of the next century, “The Legend of Monte del Diablo” became an enduring favorite among the residents of Contra Costa County in California, and eventually the legend itself became part of regional lore. In 1959 the local chapter of the Knights of Columbus voted to change its name to the Father Jose A. Haro Council in honor of the “Jesuit Priest from the early San Pablo Mission who administered to the Bal Bognes Indians, about 1770, in our immediate vicinity of San Pablo.” As the recently renamed council’s own website now sheepishly admits, both Father Haro and the mission he founded were Bret Harte’s wholly fictitious inventions. Notes: Ayuntamientos are municipal councils. Junipero Serro (properly, Serra; 1713–1784) was the Franciscan friar who founded the chain of California missions. Calaveras, now a state park, is a grove of giant sequoias in California. Bartolomé de las Casas (d. 1566) was a Dominican friar known for fighting slavery and the mistreatment of the natives of south Mexico; he was appointed the first Protector of the Indians by Spanish administrators. Ophir was the biblical region where King Solomon’s mines were said to have been located. Alonso de Ojeda (d. 1515) was a Spanish explorer of the northern coast of South America. The cautious reader will detect a lack of authenticity in the following pages. I am not a cautious reader myself, yet I confess with some concern to the absence of much documentary evidence in support of the singular incident I am about to relate. . . . If you don't see the full story below, click here (PDF) or click here (Google Docs) to read it—free! Clearly this story is fictional but could have been based on local legend and folklore. The dates given and identity of the protagonist as a Jesuit are impossible.